The cost of each class is $395 per student. Each class is limited in size (14 max) as this is a hands-on class with one-on-one guidance. NOTE: You do not have a spot in a class until you have received a BBQ Class Confirmation email. The email confirmation comes after we have received your registration form and payment. Contact us for registration form details. Please include the class date you are interested in. This is an amazing class!– Harry is not only a great cook, but more importantly – A GREAT teacher as well. The class is very well put together and you will leave with all the tools you need to become a very good BBQ chef.I would recommend this to all who want to get better at cooking and enjoy life more. Thank you for curing me of my phobia of making bad barbecue – No BBQ book, video, or search on the Internet can compare to your hands-on class. I can’t say enough good things about this class. Harry is passionate about, and loves BBQ. I share his enthusiasm, and was hoping he could help me improve my skills. He did so much more than that. This class is hands on, and he covers a lot of topics. I learned so much, and Harry is a gracious and patient teacher. I’ve been working my pit for years, and was pretty good at it too, if I don’t say so my own self, but this class brought me up to a new level of understanding. 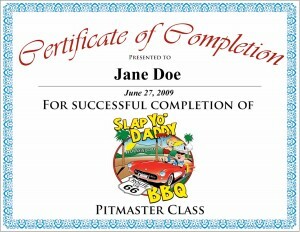 So glad I took the Slap Yo Daddy BBQ pitmaster class. 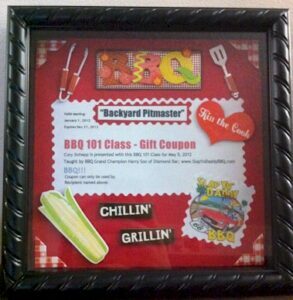 There are many choices of barbecue classes in America and many good instructors. So how do you choose? Many potential students actually read all of Harry’s 100+ five-star review comments (1) (2) before deciding for themselves (see Media). If you’re looking for an instructor who loves to teach and has a terrific track record for sharing the art and science of barbecue that’s backed by 27+ Grand Championships and 100+ first places from America, Canada, England, and Hawaii, you don’t need to look further (see Awards). Since 2009, Harry has proven that he can take you from zero to hero in six-hours in his entertaining action-packed barbecue class whether you’re a restaurateur, competitor, aspiring competitor, caterer, BBQ judge, or regular backyard cook. Of the 2,000+ pitmasters Harry has personally taught hands-on in small classes, many have gone on to win Grand Championships after class and 20+ have made it to the prestigious Jack Daniels Invitational contest in Lynchburg, Tennessee. Harry also trained the first woman grand champion pitmaster from California and the first one from Arizona. Harry’s teaching has attracted a diverse clientele of students from around the world including England, Netherlands, Germany, Thailand, Korea, Africa, Canada, and Australia. Numerous Executive Chefs and classically trained chefs from prestigious institutions and multinational hotels (Four Seasons, JW Marriott, Disneyland Resorts, high-end casinos) have all found their way to Harry’s class. This class is geared towards applying competition-style BBQ techniques to your backyard cooking including food safety, meat selection, trimming, recipe injections, rubs, mops, sprays, sauces, temperature control, BBQ chemistry, bark formation, foiling meats, and determining doneness. The class will use a variety of smokers (WSM 18″ and 22″, Comet Kamado, Green Mountain Grill), propane grill, gas oven, and focus on wood selection and fire control. In this six-hour class, you will work side-by-side with Harry to smoke, grill, bake, and prepare 15 different types of meats and sides. Sauces and rubs are all prepared from regular pantry ingredients. Class includes an all you can eat BBQ lunch of half-chickens, thighs, St. Louis style spareribs, Baby Back ribs, Rib Tips, Pork Butts, Beef Brisket, Sausage, Hot Links, Salami, and Santa Maria tri-tip. Our tri tip won 1st place in the Tri Tip Championship Throwdown in 2009 in Santa Maria, California, the tri tip capital of the world. 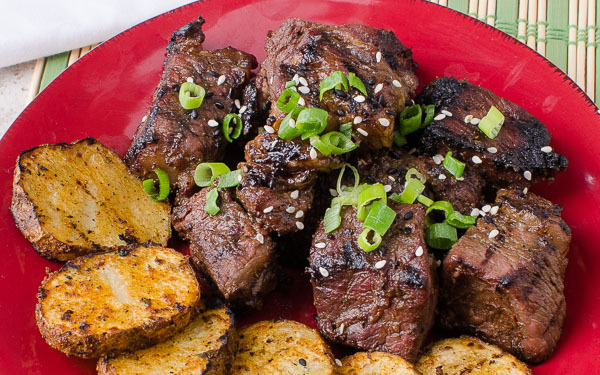 Harry often adds muse dishes to the class such as beef ribs, New Zealand lamb lollipops, Prime ribeyes, and several bacon appetizers such as Jalapeno Poppers, Bacon Wrapped Tempura Shrimp, and others. You will not leave hungry! Traditional BBQ sides that will be taught include from scratch classic BBQ beans, coleslaw, and Harry’s popular Slapilicious cornbread. You will also learn how to prepare Harry’s famous Seared Ahi Tuna with Maui Onion Dressing. Each student will take home a hefty box of BBQ leftovers and sides for your family to enjoy and a bound copy of SYD BBQ 101 class manual, Harry’s top-secret Slap Yo’ Daddy rub which will be made in class, a souvenir black Slap Yo’ Daddy BBQ apron (commercial grade), a frame able certificate of completion of Slap Yo’ Daddy BBQ Pitmaster Class, and one year of free technical BBQ support. The cost of each class is $395 per student. Checks are cashed 2 weeks prior to your class date. Each class is limited in size as this is a hands-on class with one-on-one guidance. If you see any open dates in the class schedule above, there will be a link to request a registration form beside that date. Fill out the request form. You will be emailed a registration form. Fill out that form and send it in with your payment. Once you submit this form, you will see a “Class Request Sent” confirmation page. If you do not receive a confirmation receipt, contact us. When a new class date becomes available, students who completed the class notification form will be notified of the date and given 24 hours to reply so we can email them the registration form. It is then up to those students to complete the registration form and submit payment. Receipt of registrations and payments are processed in a first come first serve basis. Once your spot has been purchased, you will receive a confirmation email and subsequent email reminders will be sent at the two-week, one-week, and three days intervals before the class date with special instructions and class location. Your check will not be cashed until 2 weeks before your scheduled class date. Please note we request that you confirm your attendance in the 2 week email reminder. If we do not hear from you, we will attempt to email and/or phone you to get a confirmation. For students flying in, the closest airport is Ontario (ONT) about 30 minutes away from Diamond Bar. If you need a hotel room, The Ayres Hotel has worked out an agreement with SYD to reduce their 2018/2019 room rate to 129.00 plus tax for a Deluxe Guestroom (standard rates range between $169-$189). Room Description: King or Two Double Queen “Ayres Dream Sleeper” beds, MP3-compatible clock-radio, coffee maker, refrigerator, iron/ironing board, executive writing desk and premium channels (whirlpool jetted bathtub in select first floor rooms). These rates are valid through the end of 2019. It also includes complimentary full American breakfast daily, evening reception with complimentary beer, wine and light snacks (Monday – Thursday 5pm – 7pm), wireless high speed internet in guestroom and public areas, parking and fresh baked cookies. 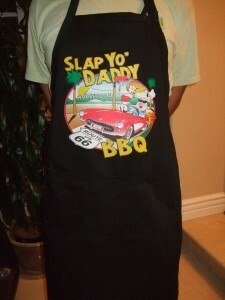 Just mention that you are a Slap Yo Daddy BBQ student to get this discount at the time of your reservation. If you wish to purchase a class as a gift for someone, please fill out the Request for Class Registration form and select an available class date. We will email you a registration form for you to complete and submit with payment. Once you have purchased a spot, we will email you a printable certificate and a confirmation of being in the class. If there are no class dates available, we will email you a registration form with a blank date. Submit the completed form and payment. When we receive your paperwork, we will email you a printable gift certificate. You will be notified once new class dates become available. To redeem your gift certificate, please email us. Tell us which class you’re interested in and mention that you have a gift certificate from us. If a spot is still available in the class, you will receive an email confirmation of being in the class. NOTE: Gift Certificates are only valid for 1 year from the issue date. This is how Jenn gave her gift to her husband. Awwww . . . If you want to be on standby for a filled class, please complete the Notification Form below and indicate which filled class you wish to be in as standby. If a spot becomes available and you are at the top of the standby list, you will be notified via email. You will be given 24-hours to respond. If we do not hear from you after the 24th hour, the next person on the waiting list will be contacted. Class runs from 7:45 am – 2:30 pm (arrive 7:45; we start promptly at 8:00; lunch around 1:00; conclude with certificates after lunch). If you’re flying in, please note that class may not end until 3:00 pm or later because BBQ is ready when it’s ready and can’t be hurried. Consequently, please don’t book your outbound flight too tightly. You won’t want to miss out on the final product and wrap up portions of the class. If you are more than 2 weeks out from your scheduled class date, we will gladly reschedule you for a future date. If you are within the 2 week window of your scheduled class and need to reschedule, we will do our best to fill your spot. If we are unable to fill your spot, we will unfortunately have to charge you for the empty seat in class. Most of the time, we can find a replacement from either the wait list or a student in a future class. This rule is intended to discourage rescheduling the last minute and leaving us insufficient time to fill your spot. Please email the Class Coordinator if you have questions. Printing for T-Shirts and Aprons are done by: Turbo ScreenPrinting. Note: All information and pricing subject to change. Please email the SYD class coordinator if you have questions. I took Harry’s class in Sept 2010. I had no smoker, nor could I even grill a steak for that matter. Nervous… you could say that. At first I found it interesting this man would invite people into his own home. But, arrived to a beautiful setting. Perfect for welcoming the class and the views and landscape just put you at ease. Harry is as laid back as he seems on t.v. He keeps his classes small, so you are not in a "sea of people". As he demonstrates each cut, and why, there is room to be around his table and watch. (this was critical for my lack of knowledge). It didn’t go so fast either, that each student couldn’t get a chance to see and ask questions. The "class" was an eclectic sort of all parts of the country and skill levels. But, there were no attitudes, just everyone sucking up Harry’s teaching. He’d teach, then we’d taste. He warned us, "go easy" lots to come. None of us did. LOL then it became apparent why. Food never stopped coming. Not only Q, but his exquisite other dishes. I don’t think any of us ate for 24 hrs after. And, guess the best thing about that is, "why would you want to"? Treat yourself to Harry’s class. A gift for a spouse or friend. I didn’t own a smoker when I took it, just knew I wanted to. 6 yrs later (just a home cook) I still refer to his handout book. Temps, rubs, sauces, he shares it all. Makes me feel like a queen when I can bring such wonderful food to family and friends. Really Appreciate this update, can you make it so I get an email every time you write a fresh post? OMG! AWESOME PRIZE!WOULD LOVE TO WIN THID! THANK YOU!